Because my dad was in poor health and it was possibly the last Christmas that my sister and her kids would spend in the Philippines, we decided to all go despite the chaos and expense of flying over the Christmas holidays. It turned out to be an excellent decision. We got to spend lots of time with everyone, and we had lots of conversations that helped us prepare for what happened. We initially planned to be away from Dec 17 to Jan 10. When my dad was scheduled for potential surgery on Jan 8, I extended my trip until Jan 26, while W- kept his original itinerary. It was a good thing I extended my stay. My dad died on January 6. We had a wonderful wake for him until Jan 11, and I had a couple of weeks to spend time with family and help with paperwork. I’m feeling surprisingly okay with the whole thing. We prepared a lot for this scenario, and I know we can get through it. In fact, this trip has helped me develop an even deeper appreciation of my family. A- had a marvelous time. She played with her cousins, who were both enamoured with her. She took to asking her Lola to read to her, which my mom did with delight. She learned many new words and names. She liked following the household staff around so that she could help with washing the dishes or sweeping the floor. She started experimenting with establishing her boundaries (“No grab. This mine!”) She stopped being anxious around dolls. She often sought out her cousins to play with them. At the wake, it was delightful to hear the kids bouncing around and being their usual cheerful selves. We might experiment with a cycle of two months in Canada and one month in the Philippines, at least for this year’s transition period. It’s going to take a lot of money and effort, but I think it might be worth it in terms of relationships and paperwork. I’ll scale it back if we get too disrupted by the changes in environment and routine, but maybe we’ll be able to take it in stride. We’ll see! I’ve been building up a small opportunity fund for A- so that it’s easy to take chances on memberships, classes, books, and other good things. After some consideration, I decided to use some of it for a membership to the Royal Ontario Museum. We’ve been working on animal names and sounds, so I figured it would be good to point to animals in addition to pictures in books, Duplo pieces, and small models at the early years centres. What do I want from the ROM? I want to develop a deeper appreciation of our place in history and nature, and I want to be able to share that with A- as she grows. I want to train my eye to recognize and differentiate various things. I want to pick up more words and share them with A-. I want to learn stories and tidbits that I can share with A- and W-. I want a quiet, sheltered, spacious place to walk with A- or hang out with friends. I want to have interesting things to look at and chat about. I want to expose A- to different sights, sounds, and textures. Sometimes they have smellable exhibits, too. I want A- to feel at home in the museum instead of it being just a destination for school field trips. I want to have something to offer to other parents and friends. I want to support culture. The benefits are mostly for me at the moment, but I hope this will pay off when A- starts asking questions about the world or learning about history. It might be handy for helping her increase her vocabulary and see how the world is connected. I’m still going to prioritize hands-on learning for her, since she needs to exercise all her senses, but I think the museum might add something useful to the mix. That means I should take notes (and perhaps photos) so that I can jog my memory, and I should slow down and point to things while naming them multiple times, paying special attention to exhibits at her eye level. I’d like to make it out to the museum at least once a week, ideally inviting other people along. Now is a good time to bring A-, actually. It’s still a bit cold and rainy, so it’s better to be indoors than at a park or playground. She’s not walking independently yet, so she usually doesn’t mind hanging out in the carrier and nursing on the go. That gives me an opportunity to join tours or read labels, and then I can think about those things when she gets antsy and wants to walk around while I hold her hand. She toddled around the Ancient Egypt exhibit quite happily, and I could still hear some of the tour guide’s stories even though A- sometimes took me around corners. Come to think of it, A- seemed to warm up to the place faster than she usually does at the early years centres. Maybe she prefers to be more reserved when there are lots of active kids. She’s still a bit hesitant to touch strange things, but that might pass in time. The math: The curator’s circle membership I signed up for lets me take three guests and four kids, includes free coat check, and costs $189. The social level of membership allows one guest and costs $149, so +$40 gets you free coat check and the ability to bring two additional guests and four children (4 <= age <= 17). Half of a two-year solo membership is $86, so +$63 gets you the ability to bring in one guest each time you come. An adult ticket is $20 (+$10 for the special exhibition), so the solo membership breaks even after one visit that includes the special exhibition plus three visits without. The premium for the social membership works after three guest visits including the special exhibition, and the premium for the curator’s circle membership works after two extra guests including the special exhibition, or lots of coat check use. (The member price of $1 per item would’ve added up quite a bit given all these coats and diaper bags!) Yay math! And now it’s a sunk cost, so I can just treat it as an investment in cultural knowledge and potential social interaction. Blue whales are huge! Standing next to the skeleton of one is a great way to realize how tiny you are. Noise pollution is a challenge for whales. Whales have really big poop flumes which can be seen from airplanes. The poop is bright orange because they eat krill, and krill is bright orange. Bootlace worms are very long. Researchers solve interesting puzzles with incomplete pieces. I liked how they pieced together the evolutionary history for whales with the help of Pakicetus. They also have to deal with weird one-off fossils like the Toronto subway deer – cool stuff! You can differentiate between mastodon and mammoth skeletons by looking at the lower tusks, the curvature of the big tusks, at whether the teeth are cusp-shaped or smooth. Cartonnage (linen and plaster) gave the Egyptians an alternative way to encase their mummies, since wood was scarce. Chinese roof tiles could be quite elaborate and well-preserved. The designs were strictly regulated in some places and more free-form in others. I’d like to go again on Tuesday and/or Friday, depending on A-. More to learn! J-‘s grade 12 physics exam is tomorrow. She’s been working through the exam review sheets that her teacher gave the class: forces, friction, gravity, relativity. The review sheets give the expected answers, so she can check her work. She asks for help when she can’t figure out how to solve the problems, or when her solution doesn’t match up with the provided answer. I’m usually the one to help with homework, since I can speed-read tutorials to refresh my memory or dig into a new topic. Sometimes it’s just a matter of nudging her towards one equation or another, or pointing out where she forgot to square a number or change a sign. Sometimes we’re both stumped, when my calculations show her math looks reasonable and I don’t see why the answer should be different. 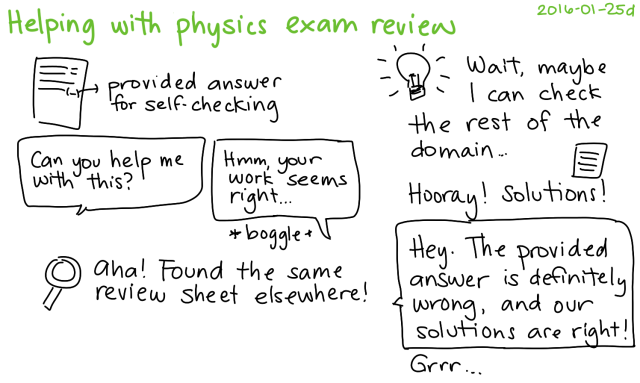 This has happened a number of times in Physics. We’ve asked her to talk to her teacher and ask him to help her step-by-step, but she hasn’t gone yet. Maybe she feels a little intimidated, or maybe lunch break is too crowded, or maybe he’s hard to track down? Fortunately, her physics teacher seems to be in the habit of reusing material posted online. When I search for the text of the question, I can sometimes find other people who have asked for help with the same problem, or a review sheet from a different school. For example, we were getting stuck on a problem that started with “A fuzzy Velcro ball of mass 200 g strikes and sticks to a Velcro block (100 g)…” We solved it in a way that made sense to us, but our answer didn’t agree with the one provided by her physics teacher. The only search result on Google was this sheet of practice questions. It didn’t contain any solutions, though, so I nearly gave up there. After making some headway on other problems, though, I thought I’d come back to that one and see if we could turn up additional resources. You can sometimes get to interesting places when you start playing around with URLs. The file’s top-level domain https://rosedalephysics.wikispaces.com/ is a public wiki for Rosedale Heights School of the Arts. The exam review on the sidebar didn’t match the exam practice document we were looking at, but a search through the Pages and Files section for June 2014 (which I picked up from the practice questions filename) turned up worked-out solutions. It confirmed that our answers and our methods were correct, and that the answer provided by J-‘s teacher was wrong. Maybe it was a typo, maybe he made a mistake, whatever. I can sympathize; I’ve made my share of mistakes as a teacher! Anyway, I’m glad J- asked for help and that we could clear up that mystery. We should probably bring it to the attention of J-‘s teacher at some point. Incorrect review answers can lead to lots of frustration, second-guessing, and a lack of confidence. Maybe W- can mention it at the next parent-teacher interview, or J- can talk to her teacher after the exam. Anyway, I guess it’s a good lesson in dealing with fallability, being resourceful, double-checking, and sometimes just trusting yourself anyway.